Comodo Internet Security is award-winning and free security software that bundles antivirus, firewall and innovative technologies to provide high-quality protection against all major threats. - Combines the latest technologies to safeguard your computer against viruses, spyware, Trojans and other types of malware. - No matter what computer activities you are performing, Comodo is prepared to protect you: benefit from powerful defense for email, browsing & shopping, IM, external devices, downloads, gaming and others. - The robust firewall integrated into Comodo Internet Security blocks unauthorized access, unknown threats and hacker attacks. 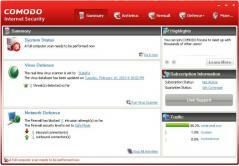 - Blocks malware attempts to install and detects and removes viruses. - Simple and friendly installation and user interface. - Free for both commercial and non-commercial use.